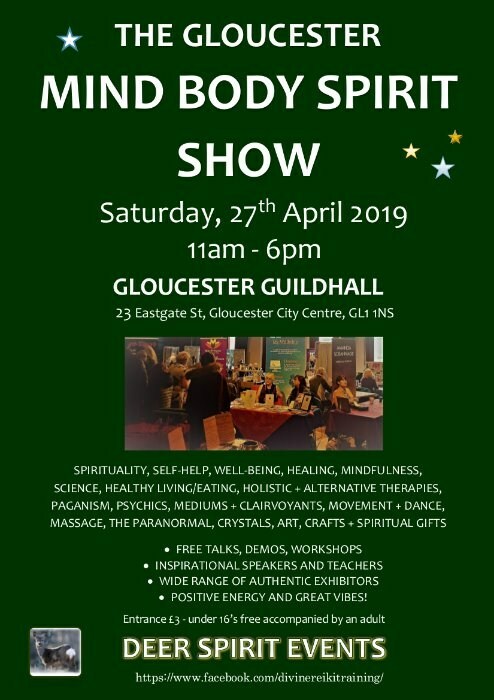 The Gloucester Mind Body Spirit Show is back at the Gloucester Guildhall!, Our exhibitors, speakers and teachers specialise in spirituality, self-help, well-being, healing, mindfulness, philosophy, science, holistic and alternative therapies, paganism, shamanism, psychic readings, mediumship, clairvoyance, astrology, numerology, healthy living and eating, movement, dance, yoga, massage, the paranormal, beauty, crystals, art, crafts and spiritual gifts. ​ At this show you will find ​ • A wide range of authentic, good-hearted, hardworking exhibitors who love to showcase their goods and services to the public • Inspirational speakers, teachers and authors • Free talks, workshops and demos (including a demonstration of mediumship) * Positive energy, likeminded people and a great vibe! Just a few of the fantastic exhibitors and speakers appearing at this year's April show Ian Banyard: Author, teacher and Founder of Cotswold Mindfullness John Odinsson Dyke: Shaman and medium, Cloudsong: Musician, healer and spiritual teacher Louise Hall: Animal communicator Michael Bisiker: Author, teacher and healer Michelle Gordon: Author, Earth Angel and unicorn expert Steve Williams: Aura Imager: Gordon Robert: Spirit Medium First 100 through the door get a free copy of Kindred Spirit magazine! Free talks, demos and workshops 11.15 - 12.00: Native American Flute and Handpan Meditation. With Cloudsong: musician, healer and spiritual teacher. 12.10 - 12.40: Finding Your True Voice. Author, broadcaster, motivational speaker, Frank Saliki 12.45 - 1.15: Way of the Wyrd. Find out how about the old European shamanic ways. Shaman and Medium, John Odinsson Dyke 1.20 - 1.50: Embodiment of the Conscious Heart - a creative expression of oneness and love. With visual and performance artist Eva Milauer 1.55 - 2.25: Using Crystals in a Modern Home. With Alex MacLean Milner, Holistic Therapist 2.25 - 2.50: A Meditation to Bring Peace in to Your Being. With Spiritual Teacher, Annie Riley 3 – 4: The Healing Power of Nature Connection for Mind Body and Spirit. With Ian Banyard - author and founder of Cotswold Mindfulness (Bluecoat Room) 3 – 3.45: A demonstration of Nia, Holistic Conscious Dance Movement. 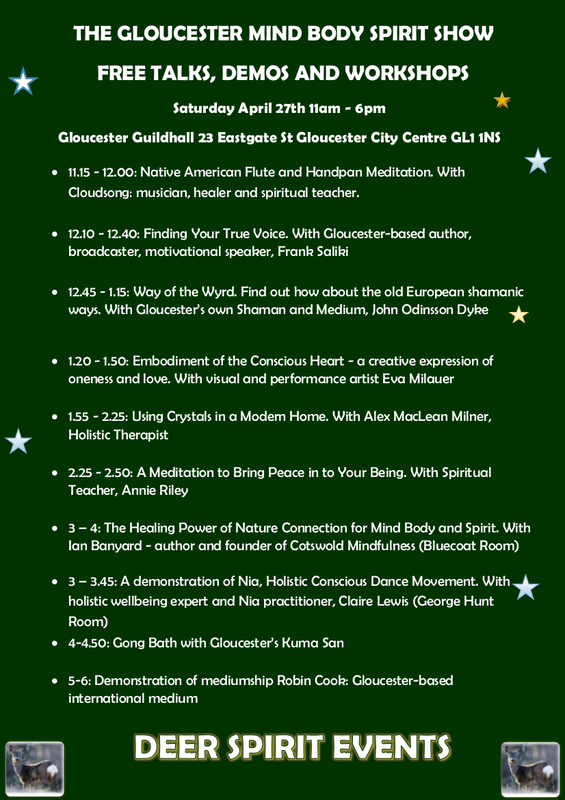 With holistic wellbeing expert and Nia practitioner, Claire Lewis (George Hunt Room) 4-4.50: Gong Bath: Kuma San 5-6: Demonstration of mediumship Robin Cook, international medium How to get to the Gloucester Guildhall On Public Transport The Gloucester Guildhall is a five minute walk from Gloucester's main bus and rail stations. If you arrive by Train, come out of the Train Station and cross Bruton Way and walk in to the Bus Station. Walk through the Bus Station on to Station Road and continue forward in to Clarence Street. At the end of Clarence Street turn right in to Eastgate Street. The Guildhall is just up on the right in between Dorothy Perkins and Lloyds Bank. By road From the North: Get off the M5 at Junction 11, at the roundabout take the 3rd exit onto the A40 (signposted Gloucester/Cirencester). At Elmbridge Court roundabout take the 4th exit (signposted Ross). At the next roundabout take the first exit onto the A38 and then at the next roundabout take the 2nd exit onto the A430 (Kingsholm Road). At the traffic lights turn left onto Black Dog Way and follow the road. At the traffic lights turn right into Bruton Way approach and then at the roundabout turn right on to Station Road. Continue forward and take the 2nd left , continue up the ramp and in to the car park. If you drive right to the top of the car park there is a back entrance in to the Guildhall. Alternatively you could follow signs to Gloucester city centre, park your car in another car park and access the Guildhall from the front entrance on Eastgate Street. From the South: Get off the M5 at Junction 12, at the roundabout take the first exit onto the B4008. At the Cross Keys roundabout take the 3rd exit onto the A38. At the next roundabout continue forward. At the traffic lights continue forward (stay in the left hand lane, signposted Ross) onto the A430, Secunda Way. Continue forward on this by pass until you come to a roundabout, stay in the right hand lane and take the 2nd exit (on to Hempstead Lane). At the traffic lights turn right onto St. Ann Way. Continue forward at the next 2 sets of lights and then continue forward at the cross road on to Trier Way. Continue forward on to Trier Way (past GL1 on your left). At the next cross roads turn left into Bruton Way approach. At the roundabout turn right on to Station Road. Continue forward and take the 2nd left, continue up the ramp and in to the car park. If you drive right to the top of the car park there is a back entrance in to the Guildhall. Alternatively you could follow signs to Gloucester city centre, park your car in another car park and access the Guildhall from the front entrance on Eastgate Street.